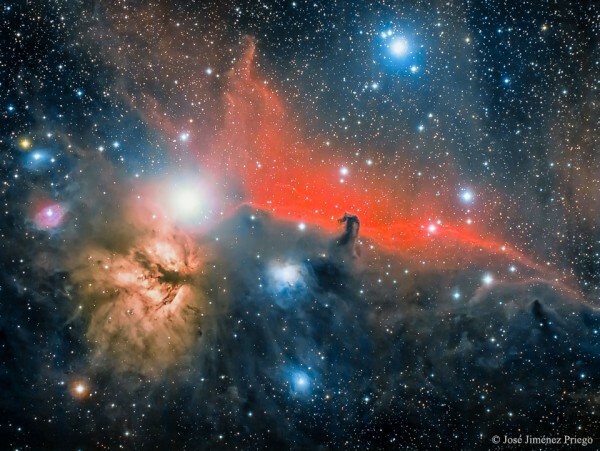 The horsehead nebula, name given … why do you think? because obviously, because it looks like a horse head. Although you may not believe that gas is not the nebula has thus cosmic dust but because there is a flash, you have that. That is, it is dark opaque dust that leaves the light and gives us that peculiar form. Best of all, the era in which we live is that with the winds and cosmic radiation, the shape of this cloud of dust vary, then we are fortunate that now have that. The red zone, the rear red nebula, is a mass of excited electrons (come loaded) colliding with protons emitted in the band of red due to hydrogen. That is, the hydrogen electrons excited by cosmic rays colliding with protons of hydrogen and emit light in that range, some … really lovely. In this picture, on the left, you can also observe a cosmic nebula style called black powder with blue dots next to it is nothing but black cosmic dust that reflects the light of blue stars around. An image, just incredibly beautiful.